Want to sell your junk car for cash in New Hampshire? The Clunker Junker can help. We pay cash for junk cars in New Hampshire and give instant offers up to $10,000! The state motto of New Hampshire is “Live free or die”. Well, we certainly don’t wish death on anyone, but we want you to be able to live free from your junk car! That’s why we pay cash for cars in New Hampshire and pick them up at no extra charge. If you’re looking for a reputable junk car buyer, one that won’t take advantage of you, look no farther than The Clunker Junker. We are currently buying junk cars, trucks, vans, and SUVs all across The Granite State. You may have many options when you need cash for junk cars in New Hampshire, but you won’t find any car buyers who will pay more for your car or treat you as well as we do. From Nashua to the White Mountain National Forest, we buy junk cars, trucks, vans, and SUVs. We’ve spent more than a decade perfecting our junk car removal service to provide you with a smooth, fast, easy experience when selling your junk car in New Hampshire. New Hampshirites know first hand how bad the winter weather can get. While the snow can be beautiful and create serene winter landscapes, the extreme cold and salt can wreak havoc on your car, and the roads. If your old clunker has started rusting away due to road salt, or you hit a big pot hole and cracked your rim, we will buy your car. We don’t particularly care what condition your car is in as long as it is complete. Enter the details of the vehicle through the form above and get your instant offer now! Whether you’re junking an Ultra-luxury sedan or budget-friendly SUV, you’ll need to know some specifics about your clunker in order to sell your junk car in New Hampshire. Telling us the exact year, make, and model of the vehicle will give us a general idea on how much we can offer you. But don’t sweat it: We still pay top dollar for junk cars in New Hampshire, even if they’re way past their prime. Like the amount we’re offering for your jun car? All you have to do next is click “accept,” and we’ll work on getting your cash payment ASAP. At this point, we'll need some things like your phone number and exact pickup location for our New Hampshire junk car buyers. We may also need photos to verify the condition of the car and ownership documents. But that’s generally not the case. After you accept our cash offer, we’ll schedule your vehicle for pick up within three working days in many cases. When the junk car removal specialist arrives, he or she will give you your cash or check payment for your keys, title, and vehicle. Towing is free, so you can rest easy knowing there are no hidden fees. We buy junk cars in New Hampshire, and virtually every complete junker that comes our way is accepted. However, we do separate our junk cars into three separate groups when we figure out how much to offer you. If your ride has seen its fair share of road salt and is now rusting away, then it probably belongs in our first sorting group. These cars are, for the most part, recycled for raw materials by New Hampshire junk car buyers or junk yards, so size and weight of the vehicle will determine the money we’re able to offer. For such rusted beaters, you might expect a $25 to $125 offer from us before we take it to a New Hampshire auto salvage yard. But if your car isn’t exactly falling apart at the fenders, it may still have some life in it. You can expect these cars to fetch more than the ones with rusted-out floors. However, we won’t know exact pricing until we get more info on your exact vehicle. Then we have the “This car isn’t junk!” group: cars that could be driven off a used car lot, as they are. Because of these cars’ overall good condition, these can be worth anywhere from $200 to $10,000. We have put together a simple guide and example for how to sign your New Hampshire title when you are selling your vehicle. If there are multiple owners listed on the title, they must all sign the title unless the names are separated with "OR". To get started, flip over your New Hampshire title to the back and find the section that says "Assignment of title" at the top. 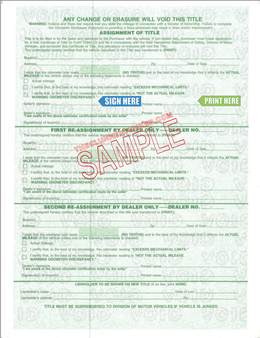 You're selling your car, so don't sign the title as a buyer or dealer. First sign the back of the title where indicated by "Seller's signature" (see image). Print (don't sign) your name on the back of the title where it reads "Printed name". 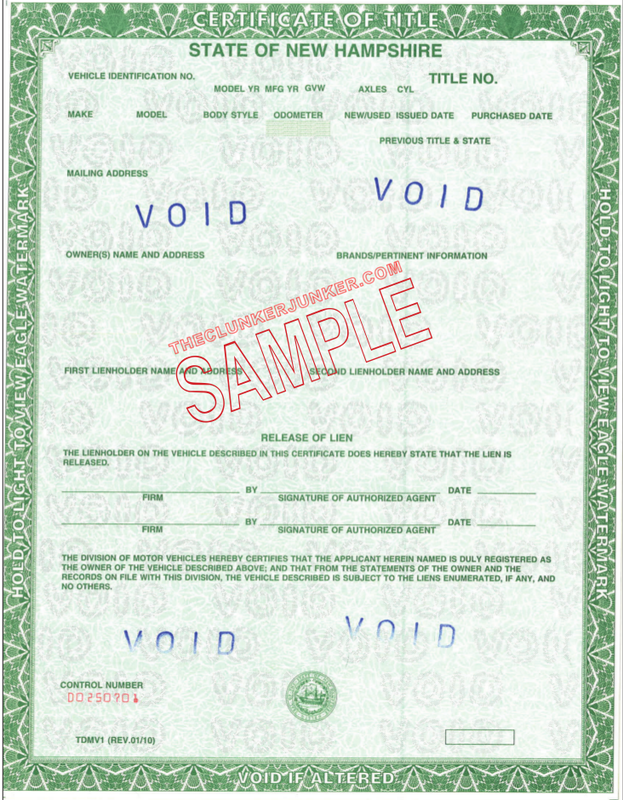 Fill out the New Hampshire Application for Duplicate Certificate of Title. Complete a lien release if needed. Please note that there is a three to five day waiting period before a duplicate title can be issued and the cost is $25.00. (Paid to the NH division of motor vehicles). Getting rid of an abandoned vehicle in New Hampshire can be a difficult process. Unfortunately, you cannot just sell any junk car that ends up on your property if you do not own it. You'll need to follow the New Hampshire abandoned vehicle removal procedures. We have given a general overview of what that entails below. To have an abandoned vehicle removed from your property, you must first contact your local law enforcement office. 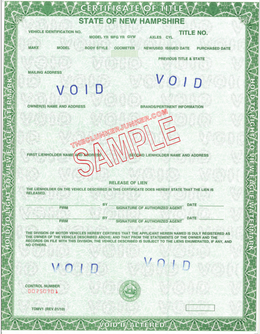 If you would like to apply for the title to the vehicle, you must first attempt a Title Search to seek the last registered owner of the vehicle. Title searches can be requested by attorneys, private investigators, towing companies and repair garages. You will need to enlist the assistance of an attorney. Can you buy cars in New Hampshire without title? In some cases, yes. However, we cannot buy every vehicle in NH without title, it is at the discretion of our buyers. If the buyers do decide to purchase the vehicle, they will require proof of ownership in the form of a valid registration that matches your photo ID. New Hampshire often changes their title documents from year to year. If you have questions about your specific title, please contact your New Hampshire DMV. Swapping out junk cars for cash is our bread and butter. Before you go gunning your car off the Hampton State Pier, hit the brakes and get in contact with The Clunker Junker. We’ll give you the cash you deserve and spare you from launching your car into the ocean. "The engine starts and runs until you put it in gear. The car stalls out shortly after it's started. You may get one minute of it running. We don't know what's wrong with it. I had my wife's uncle look at it, and he can't figure it out." "It has been sitting for four months. The battery is now dead. I drove it to its parking spot in the garage, after it was spitting out a lot of white smoke from the exhaust. I have not driven it since then. It has a 32 valve Northstar in it." "The only dent that's larger than a fist is on the rear body panel by the taillights, and one taillight is busted. Other than that, it's intact. It's just not running due to starter problems or something like that. " "I took the driver door panel off to fix the window motor and haven't put it back on, but I do have it. It also has an aftermarket exhaust and cold air intake." "The transmission has a leaky front seal requiring seal replacement. In the last month, two new tires have been put on the vehicle, a new alternator has been added, and the rear axle was replaced via recall work." "The vehicle suffered a trunk fire. The interior smells of lingering toxic smoke, and the fire department put out the fire with a fire hose to the trunk, so there is water and fire damage in that area. Otherwise, everything under the hood works, the exterior is decent, and everything is still in one piece." The Clunker Junker is one of the top junk car buyers in the state of New Hampshire. To date we have made instant offers on over 10 thousand vehicles across the state, totaling over $3 Million offered! Of those vehicles, approximately 6% were purchased without a title. We also buy cars on a wide spectrum of conditions and 48% of the vehicles we've made offers on in New Hampshire do not start or drive. Many also have moderate to severe body damage. Manchester in Mendocino County was our top producer, followed by Nashua.